After quite some debating, our team of specialists chose a winner from the call centre headsets which made the list. And it’s the Plantronics HW261N! They believe that it really does tick all the boxes of quality, efficiency, comfort, longevity and style – whilst not at all breaking the bank. 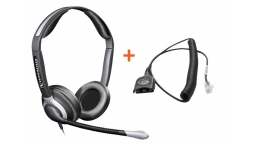 We love it – get the entire range of Plantronics HW261n devices + similar headsets from PMC Telecom at the best prices. 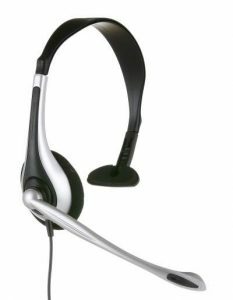 A badly designed or unsuitable office headset can go a long way in creating a bad working environment, not least because the people wearing them will not be working at their best. Happy call centre staff, happy customers – right? Well yes. But there’s way more to it than that. 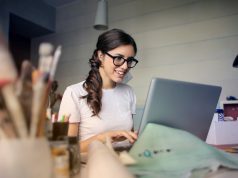 We are in an unavoidably fast-changing world, and technology keeps giving birth to new and better versions of those products we know and rely on in the workplace. Now in 2018, we’ve got Bluetooth, wireless devices with previously unfathomable wide range capacities, noise cancellation technology and a whole world of complicated software dragging us along with it into the future. It’s up to us to embrace the change. 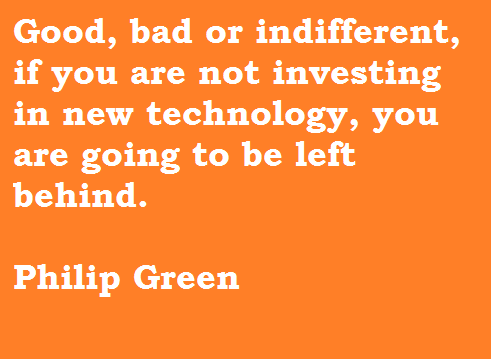 Headset technology is rapidly changing and improving the quality of business operations. It’s important to keep up. But who has the time for that? 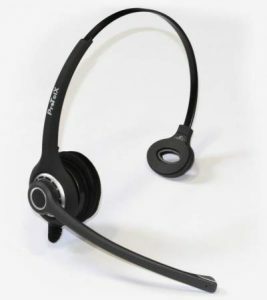 Thankfully, we’ve been doing some extensive research in conjunction with headset experts PMC Telecom to assess the current market and come up with a fresh, up to date guide on the best call centre headsets out there. With a little work, we’ve found some of the best technology out there that is affordable and perfect for a cutting edge call centre. You’re welcome! Here’s what we found. The Jabra Evolve range has come up time and time again for being a powerhouse of a call centre headset. 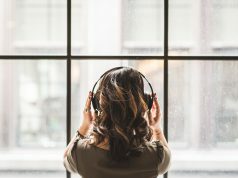 There are countless monaural (one ear) and binaural (two ear) designs, often with above standard noise cancelling technology designed especially for the busy workplace. They are famous for extensive comfort, and options range from lower end such as the Jabra Evolve 20, to the prestige, high spec, luxury designs such as the brand new Jabra Evolve 75, released in June 2018. Plantronics are setting the standard for quality, and they know how to do call centre headsets. Hands free voice command, noise cancellation, audio streaming…the list of useful features goes on. This particular headset has been featured on# #PCmag# and has soared to the top of favourite lists for several different versions of its business headsets. A PCmag review describes it has “a refinement and evolution of an award-winning design that just works.” We happen to agree. 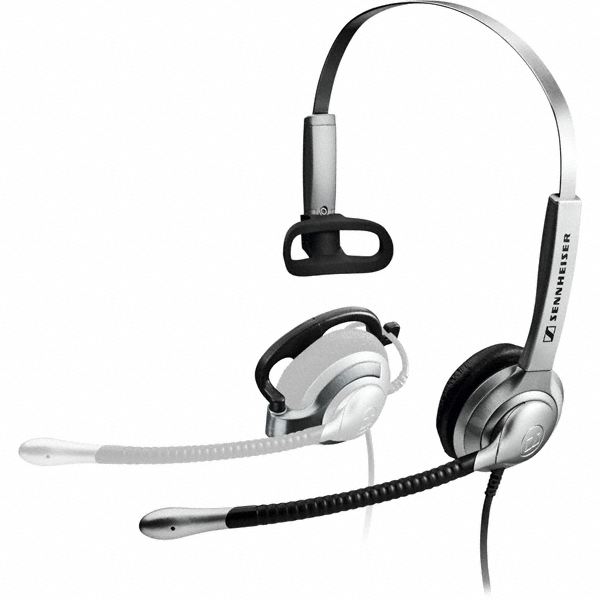 Sennheiser CC550 is a clear winner when it comes to specifically-made call centre products. Its ultra-noise cancellation feature and boom microphone blocks out the vast majority of noise, allowing the user to give 100% attention to the caller. This headset is quite well known for being comfortable, with extra-large ear caps and leatherette comfort pads. When you are wearing a headset for up to eight hours a day, this level of design is a deal breaker. You can find the Sennheiser CC550 on their website. This is quite a special headset – and as Plantronics have had their headsets in every NASA space mission ever carried out, we’d like to give them the respect they deserve. But what about for a call centre? Here’s the impressive thing. 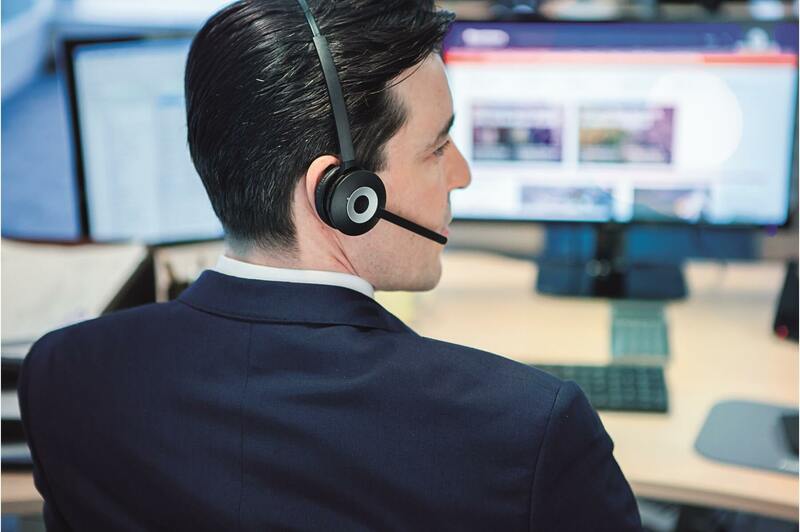 The Plantronics HW261N headset has such resilience and longevity with such high sound quality, that they are often ordered in bulk to large call centres and offices who swear by them. They must be doing something right, then. 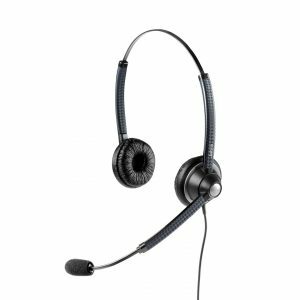 Riding on the same reputation as the HW261N, the HW251N is another highly sought after call centre headset choice. It has the much-loved noise cancellation microphone and actively cuts out background noise whilst being adaptable to various communication platforms. It has been picked by our experts because of its continued popularity for business and call centre environments, and gets its fair share of good feedback from those who use it on a daily basis. The Plantronics CS540 DECT headset is top of the range when it comes to sound quality, comfort, battery life, value for money, design and range. 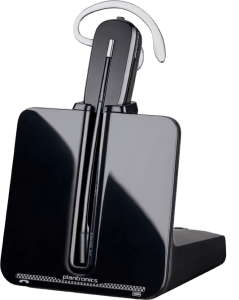 This is a nifty and efficient wireless headset which gives you ultimate freedom in a call centre environment, and shows time and time again to be a best seller in 2018. We liked this one so much, that we made an entire guide on how how make the most of it in your contact centre. You can also find a very useful Plantronics CS540 review here for more detailed information about its features, benefits and disadvantages. 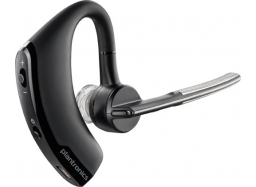 The Plantronics C565 Cordless Headset is Plantronics’ latest headset – replacing the C65 model. Despite it’s recent appearance on the market, it has become a very regular order, according to the technical team at PMC Telecom, and even gives the very highly regarded Plantronics CS540 a serious run for it’s money. Why? It’s even more lightweight at a mere 22g, with a thought out design allowing a range of wearing styles – over the ear, around the back of the neck, or whatever is the most comfortable for moving around. Like its predecessor, the Plantronics C565 offers cordless mobility whilst managing high-quality phone calls – perfect for a busy workplace or any situation requiring you to be hands free and mobile. Although the standard call centre requirements are to be seated and focused on your conversation, there is a changing world in which more mobility may be required to provide the best service possible to you clients. The SH 335 is a mid-range yet sturdy and reliable headset from Sennheiser. Its flexible design enables users to switch between ear-clip and headband wearing styles, making it ideal for call centre use. 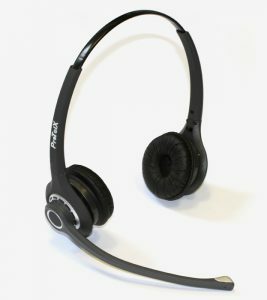 One of the more basic call centre headset designs, but the Agent 800 Binaural NC is what is says on the tin and is a popular choice for call centres in 2018. With two earpieces and a noise cancelling feature, the Agent 800 is ideal for noisy offices. 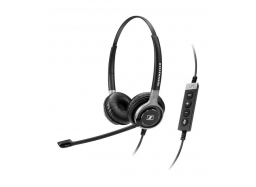 It delivers high quality sound and has adaptable, cushioned ear pieces which help call centre staff to stay comfortable during the long working day. That being said the ProTelX PTX range is a far higher quality headset for this price and spec range. 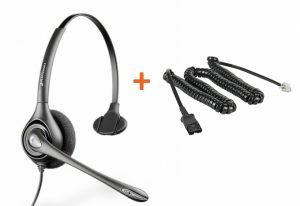 The Jabra UC Voice 150 is a corded headset which was specifically designed to master one-to-one communication in a busy environment. This duo headset has a well-liked design with is suitable for light, daily use. 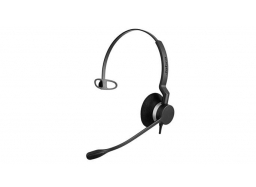 Employees and customers enjoy a clearer conversation, with the headset’s noise-cancelling microphone and wideband audio that optimises the employee’s voice and transmits it with clarity. Also, Jabra are among the kings with it comes to business-use headsets. We both like and trust them. As stated earlier, Sennheiser come out on top with headsets and give their rival brands a run for their money. This one in particular stands out for its HD voice clarity and bulky, comfortable ear pads which cancel out noise and maximise comfort. This is the highest quality premium headset under the £150 bracket available. The Sennheiser Century 660 has intelligent noise cancelling features which work like a charm in a busy call centre or any noisy working environments creating the highest audio quality. If you are ok with passive noise cancellation, this binaural headset from Snom is well worth its weight for call centre use. The A100D, very much like its monaural counterpart the Snom A100M, is a wired headset designed for maximum comfort and performance. Its lightweight and ergonomic design means it can be worn comfortably all day. Crystal clear communication and high definition sound is ensured. The two speakers ensure perfect isolation in noisy environments. At approximately £270, the Jabra Motion Office is in a higher price range than many other of our favourite products in this list, but it is for good reason. This is truly a stunning headset. The huge wireless range, the call quality, the comfort, the battery life, everything about it resonates with quality. If this is in your budget, it’s worth every penny and will not let you down. A reliable, affordable, and simple professional wireless headset that doesn’t compromise on sound quality. This headset comes in both DECT and Bluetooth versions and is perfect for desk phones and computers. Calls can be taken from as far as 100 metres from your desk, which is perfect for those who need to move around whilst talking to customers rather than putting them on hold. It’s been noted also that this headset is very easy to use with its plug and play feature. 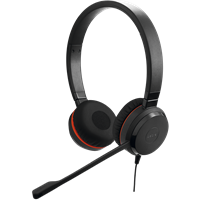 The Jabra Biz 1900 is pretty similar to the JPL 501 in price however for just £5 more per headset it comes with slightly more in terms of features. This particular headset is a WiFi and DECT compatible device with the high quality noise cancellation that you would expect from Jabra. The acoustic shock protection software and quick disconnect plug add to the attractive features and we think it’s no surprise that the Jabra Biz 1900 ends up being a choice for call centres. Another Jabra winner – this headset comes with a vast range of impressive features which means it made it onto our list of the best call centre headsets ever. 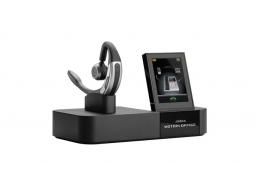 Though more than double the price of the Jabra Biz 1900 – it still offers great value for money and is perfect for smaller companies who want to equip their workforce with a really high quality headset. It has been flagged up as a favourite on a number of occasions, largely owing to the fact that it has HD voice and wide-band features, as well as noise cancellation software and a 360 degree arm for adjust-ability. The air shock technology has had good reviews and, as with so many other Jabra headsets, it is a famously comfortable design which can be adjusted to your needs. Many people are dismissive of the Plantronics Audio 648 due to its less than traditional design. The behind-the-neck wearing may not be the most stylish option but for many it is the most comfortable and comfort must be a priority when choosing headsets for your team. The audio quality is great and at just £25 you can’t really go wrong. Hopefully this list has been helpful in helping you decide what headset is best for your contact or call centre. 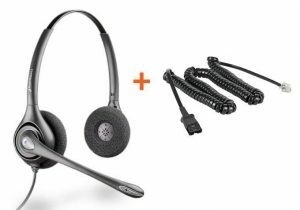 Don’t forget, apart from the high flyers like Panasonic and Jabra, there are a number of budget brands which offer a high standard of call centre headset for a competitive price. The growing brands are often worth checking out as they offer good products without the top prices. ProTelX stands out as one of these brands with their monaural and binaural models which we have taken a look at. The ProTelX PTX-102 is a budget, monaural headset which comes in at a low price, but still has sought-after features such as noise cancellation technology. Despite it’s low price (as low as £51.46 at PMC Telecom) – it is quite a heavy-duty model with a crisp, clear sound. ProTelX is an up and coming brand and if this headset is anything to go by, they offer a value product which will lead to them competing with larger brands in the future. As you may have guessed, the PTX-202 is the binaural (dual-ear) version of the 102, and has more of less the same features. For a call centre environment we recommend a binaural option to ensure the agent’s undivided attention during a call with a customer. The noise cancellation on this headset is active, meaning it has a noise-cancelling microphone boom. A nice touch, we thought, was that this is also compatible with any Plantronics bottom cable, which is useful to say the least. 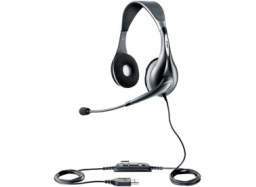 Another budget but high quality headset which we think is great for a busy workplace environment. A review of the ProtelX PTX 102 and 202 can be found here. JPL is on a par with ProtelX when it comes to affordable quality. 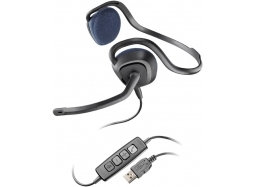 The 301 Monaural headset is very comfortable and simple, yet also perfect for VoIP and Internet chatting (most certainly ideal for a contact centre environment). With it’s independent volume control and mute switch, we can see how it’s design had a busy workplace in mind. The JPL 302 has the same noise cancellation technology as the ProTelX PTX-202, and is arguably on a par in terms of comfort, ease of use and quality. 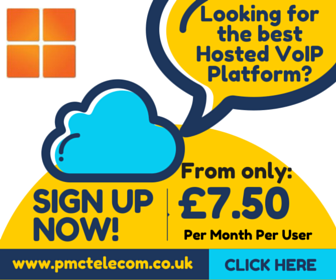 Also designed for VoIP and Internet chat. 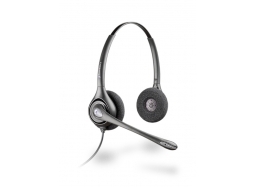 JPL is known for providing a high level of comfort when it comes to office/call centre headset models, and this is perhaps the most recommended model for such a purpose. 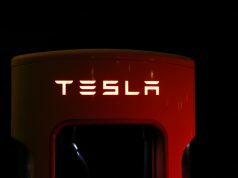 Previous articleDriverless cars could take the wheel as soon as “next year” – really?